President Edgar Lungu says he fears that the ruling PF might lose its traditional stronghold, the Copperbelt if it does not do certain things right. Addressing an internal meeting of the party’s presidential leadership at the Presidential Guesthouse in Kitwe, President Lungu said the Copperbelt is a very sensitive place of the ruling party. President Lungu called for unity among all party structures if the party is to win the August elections. He appealed to those hoping to stand on the party’s ticket not to ditch the PF when they are not adopted by the party. President Lungu said true loyalty to the party is tested when members who were not adopted opt to stay and campaign for those that have been adopted to represent the party. “The Copperbelt is a very sensitive place for us, if we do wrong things, we end up damaging the name of the party and who are the losers, it’s the party,” he warned. He added, “If you are a sincere member of the party, it is important that you stay within the party and support whoever is picked by the party. This should not be the time to say that since I am not adopted, let me go and disturb things,” said President Lungu. President Lungu also used the occasion to urge the provincial leadership to condemn political violence. “The issue of violence in the political arena is of grave interest and of a serious nature to all of us, I am glad that you have vowed to say that no to violence, Zambians want peace. In the UNIP era, we had the Vigilante and they are the ones who made KK lose because Zambians just hated that system. Came the MMD and people realised that they also started the same UNIP systems and people lost interest. It would be foolish for us to start the same things in just five years,” President Lungu said. Meanwhile, PF Copperbelt Provincial Chairman Stephen Kainga assured President Lungu that the party on the Copper belt is intact. Mr Kainga also told President Lungu that the provincial leadership of the PF has embarked on an ambitious voter recruitment by creating more party structures. He further assured President Lungu that the PF on the Copperbelt will give him the much needed 50+ 1 victory in the August 11th 2016 polls. Is this the president speaking or someone else. It is dawning on him rather late. You can not undress people and beat them up to the polling booth and expect them and their sympathizers to vote for you. This Lungu, the mother fuc.ker, has regard for the police at all. He telling the vigilantes to protect the women knowing too well that it’s his cadres that attack then. 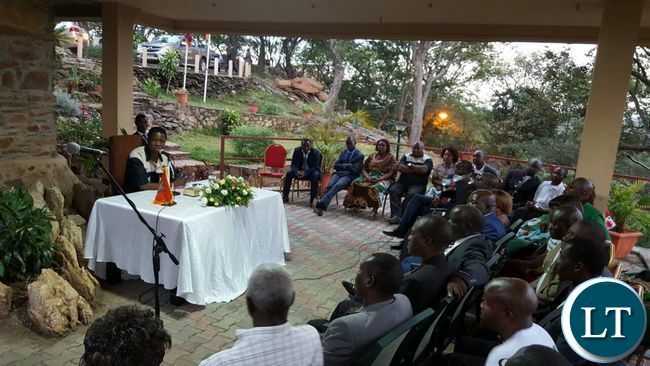 The monkey has reduced the Zambian presidency to Kaponya levels….unadulterated mediocrity!!! Did he need a public address system for such a small crowd? We need confidence and not weakness in your voice Your Excellency. You are the PRESIDENT of the party and the Republic. Exercise the full confidence of your office. Be rest assured that we have all the structures intact on the Copperbelt and elsewhere. Have no doubt, we’re winning again. Come 11/08 we are retiring the violent breed of opposition thugs, prostitutes and Kaponyas. I beg that you don’t allow them back into government these sleazy Under5 basturds Miles, Mulenga, GBM and company when they come crawling back. This chap. Do you have a job?? Or are you one of the hired people to talk good about a useless president. Please Kudos get a job and do something productive with your life than support a useless person. Every minute overwhelming evidence piles up that this man absolutely doesn’t know whether he is president of the country or a simple cadre in the party. Did you hear what he said? The youth, not the law enforcement officers employed to carry out this duty, must protect the women. Can someone please, please remind this useless president that the sensitive things he should be focused on is the economy and better of the country not securing the presidency for himself. You know, if you do your job you don’t even have to campaign. Your actions will speak for themselves and people will approve your decisions. Been president is working for the people and you have to respect the people’s time. We the Zambians did not pay you to be campaigning but try resolve issues. Campaign time will come but for now as president of the republic, if you really cared about Zambia. You would be in State house talking to economists, accountants, engineers etc. on how to resolve the current issues facing the Zambian. Actually you should have been doing this in January 2015. The only way to Go is for NEC ,to adopt those people who are liked at the grassroots level, not to go by their NEC favored candidates. If u listen, this IS a very vital point, PF TAKE IT OR LEAVE IT. I am sure you have heard for yourself, since the party is adopting the young man in your constituency, give the young man the support. The president has said it. So what next for you, head to UK? u wil swallow a bitter pill august bcoz in one year u distroyed the country completely. how a state house minister in yo bedroom join opposition u are finished means all state house intelligence is for opposition and secrets revealed. Mulenga Sata said…..” When I meet my father(MHSRIP)….I will inform him that Abena Frank Bwalya naba Dora Siliti eba le KONTOLOLA nomba Party yenu mandala…….Kikikikikikiki. @chilyata, lets have respect for leaders. Lungu may have his shortcomings. But as the republican president he deserves respect. we can point out a wrong in a civil way. Am neither PF nor a cadre of any political party. I am an aggrieved citizen because of ECL’s economic mismanagement but I can’t say ‘F’ words to my leader. who we voted in ourselves and danced victory the whole night. I think apologize man and withdraw your comments. Comment:Grassroots level matters who wud be adopted follow de majority not minority.eg pipo in chawama wnts Potifar Tembo nd he won de adoption process in de last election wen u ascended 2 power u even knw tht Mr presdnt bt instead u gav dem Sichalwe nd this tym arnd pipo stil wnts de same person again we re watchin…. Because the Copperbelt is sensitive to him, he allows his senseless cadres to ferry people in the tipper trucks, irritating productive citizens by carelessly blocking roads which have no relevance to his entourage and making irritating noise in the city without concern of disturbing patients in hospitals. Wwhat kind of a President is this man? Because the Copperbelt is sensitive to him, he allows his senseless cadres to ferry people in the tipper trucks, irritating productive citizens by carelessly blocking roads which have no relevance to his entourage and making irritating noise in the city without concern of disturbing patients in hospitals. What kind of a President is this man? By the way, what do the traffic laws say about ferrying passengers in tipper trucks? If you claim to detect a repetition, where is my comment? Comment:He has realised that ,he has given CB to upnd. Your cb chairman can’t tell u the reality.Otherwise things are bad for p.f. Thank you Mr Kainga for speaking life into the Copperbelt issue. President Lungu must never speak in the Negative. You will win, but Faith is Trust in God to open the eyes of the people to select the best. President Lungu needs to search his heart before God to ask himself if he considers his intentions for Zambia are the best. If President Lungu ‘goes to the Mountain of Faith to search himself before God, he will receive the Blessing of God Almighty through Jesus our Wonderful Redeemer. Do not be Defident, Walk like the Son of the King, in all your language. Violence was highest with the Sata and Kanimba period, but remember it was Sata who rejected it by unceremoniously removing Kabimba. Thats Kabimba by the way. Chief Henchman who caused much trauma in the Land. Criminally Insane character that he is. I AGREE A 100per cent with CONGO ZAMBIA PLEASE PF IF YOU MUST WIN THESE ELECTIONS LEARN SOMETHING FROM THE UPND AND HH; DONT ADOPT PEOPLE WHO ARE REJECTED BY THE PEOPLE IN THEIR RESPECTIVE CONSTITUENTS. PLEASE NEC ADOPT PEOPLE WHO ARE POPULAR ON THE GROUND. IF YOU DONT DO THIS, YOU WILL HAVE PEOPLE WHO SHALL OPT TO STAND AS INDEPENDENTS ADN YOU SHALL END UP DIVIDING THE VOTE IN YOUR STRONGHOLD AREAS.